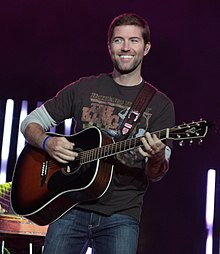 Hannah, South Carolina , U.S.
Joshua Otis "Josh" Turner (born November 20, 1977) is an American singer and actor. In 2003, he signed to MCA Nashville Records. That same year, his debut album's title track, "Long Black Train", was his breakthrough single release. His second album, Your Man (2006) accounted for his first two number-one hits: "Your Man" and "Would You Go with Me", while 2007's Everything Is Fine included a No. 2 in "Firecracker". Haywire, released in 2010, produced his biggest hit, the No. 1 on the country charts "Why Don't We Just Dance" and another number one in "All Over Me". It was followed by Punching Bag (2012), whose lead-off single "Time Is Love" was the biggest country hit of 2012 according to Billboard Year-End. Growing up in the church, he founded a gospel quartet called Thankful Hearts, where he sang bass, in addition to singing the bass and baritone parts in choirs. After high school, he spent some time at Francis Marion University before moving to Nashville, Tennessee to pursue a career in music and enrolled in Belmont University. After college, his fledgling career got a boost on Dec. 21, 2001 during his debut on the Grand Ole Opry, when he debuted a song he wrote titled "Long Black Train". He received a standing ovation in the middle of the song, then sang it again for an encore. On December 21, 2001, Turner debuted on the Grand Ole Opry with the song "Long Black Train". In 2003, Turner released his debut album, also entitled Long Black Train. Prior to its release, Turner had released 7" vinyl singles of "She'll Go on You" and "Long Black Train". Both singles featured Long Black Train album track "Backwoods Boy" as a B-side. While neither "Backwoods Boy" nor "She'll Go on You" were successful (the latter peaking at No. 46 on the country charts), "Long Black Train" spent more than forty weeks on the Billboard country charts, reaching a peak of No. 13 and receiving a gold certification. The third single, "What It Ain't", was less successful, reaching No. 31. In early 2006, Turner released his second album, Your Man. The album's first single and title track, "Your Man", was written by Jace Everett, Chris DuBois and Chris Stapleton and released in late 2005. "Your Man" also climbed the charts slowly, eventually reaching No. 1 in early 2006. Your Man was certified Gold by the RIAA four weeks after its release, and went Platinum six months later. "Would You Go with Me" was the second single released from Your Man. Like the album's title track, "Would You Go with Me" also reached the top of the country singles charts, holding that position for two weeks; it also reached No. 48 on the Billboard Hot 100. Turner also performed it on the CMA Awards in November 2006. Shortly after the album's release, a song called "Me and God" was released as a single to Christian radio. A duet with bluegrass musician Ralph Stanley, the song also featured members of the band Diamond Rio on background vocals. "Me and God" reached a peak of No. 16 on the country charts. In December 2006, the 49th Annual Grammy Award nominations were announced. Turner received nods for Best Male Country Vocal Performance and for Best Country Album. That same month, featurette on CMT Insider showed Turner in the studio working on the album. He mentioned that he wanted it to sound like music in the 18th and 19th centuries. Turner performed at the Ryman Auditorium where a live album was recorded, singing a song called, "Church in the Holler". Turner's album Josh Turner: Live At The Ryman was recorded in April and is available exclusively through Cracker Barrel restaurants. Turner, along with veteran songwriters Brett James and Don Schlitz, wrote a song entitled "Say Yes"; recorded and released by singer Dusty Drake in 2007, the song was a minor Top 40 country hit for Drake, peaking at No. 36. On September 29, 2007, while giving an award to Roy Clark on Clark's 20th anniversary on the Grand Ole Opry, Josh was invited to become a member of the Grand Ole Opry. He was inducted by Vince Gill on October 27, 2007. He is the second youngest member after Carrie Underwood. Turner's third studio album for MCA Nashville, titled Everything Is Fine, was released on October 30, 2007. Its lead-off single, "Firecracker", became Turner's third Top Ten hit on the country music charts, peaking at No. 2. The second single from Everything Is Fine, a duet with Trisha Yearwood entitled "Another Try", was released in late January 2008, peaking at No. 15. The title track was released as the third single and peaked at No. 20. Everything Is Fine has been certified gold. Turner's fifth studio album, Punching Bag, was released via MCA Nashville on June 12, 2012 and preceded by the single "Time Is Love". The song, written by Tom Shapiro, Tony Martin, and Mark Nesler, was released digitally on December 20, 2011 and went for radio adds on January 9. The song reached No. 2 but finished the year as the No. 1 country song of 2012 according to Billboard. The album's second single "Find Me a Baby", was released to country radio on October 15, 2012, but it failed to make top 40 on the country charts. Also in 2012, Turner released Live Across America with twelve of his songs recorded in concert in different cities. This album was distributed through Cracker Barrel. Turner said, "Those are the most magical performances of each song." Turner played George Beverly Shea in the 2008 film Billy: The Early Years, about the evangelist Billy Graham. Shea was the soloist for the Billy Graham Crusades. Turner has one brother and one sister. He is a devout Christian. About that he says, "I don't believe God wants me to be a gospel singer, he just wants me to be a Christian singer. That's who I am, a Christian." He married his wife Jennifer Ford in 2003. They met at Belmont University, where they both attended school at the time. Jennifer travels with Josh when he's on tour, playing keyboards and singing background vocals. They have four sons, Hampton, Colby, Marion, and Samuel. ^ "The Fab Five June 2011". sogospelbackrow.wordpress.com. 2011-06-01. Retrieved 2017-02-25. ^ "20 Questions With Josh Turner". CMT.com. 2004-01-27. Retrieved 2016-09-30. ^ "Archived copy". Archived from the original on 2006-11-23. Retrieved 2007-04-11. ^ "Archived copy". Archived from the original on 2007-10-25. Retrieved 2007-09-30. ^ "time-love"-available-itunes-tuesday-dec-20 "Debut Single "Time Is Love" Available at iTunes This Tuesday, Dec. 20". Retrieved March 12, 2012. ^ a b Palisin, Steve (June 14, 2013). "Crooner Josh Turner back at Alabama Theatre in Myrtle Beach area". The Sun News. ^ "Josh Turner 'Pushing Forward' With New Music After Delays". Tasteofcountry.com. Retrieved 2016-09-30. ^ "Josh Turner Talks 'Hometown Girl,' Upcoming Album". Sounds Like Nashville. 2016-09-16. Retrieved 2017-03-08. ^ "Josh Turner rides country music train to Dover Downs". Delaware State News. 2016-04-21. Retrieved 2016-09-30. ^ "Josh Turner to 'Represent Hardworking People' With Upcoming Album". Sounds Like Nashville. 2017-01-29. Retrieved 2017-03-08. ^ "Sony Music Nashville |". Aristanashville.com. 2016-09-15. Retrieved 2016-09-30. ^ Josh Turner /. "Josh". Josh Turner. Retrieved 2016-09-30. ^ "Josh Turner - I Am Second". Iamsecond.com. Retrieved 2016-05-02. ^ "Josh Turner Welcomes Son Samuel Hawke – Moms & Babies – Celebrity Babies and Kids - Moms & Babies". Celebritybabies.people.com. 2014-05-20. Retrieved 2016-09-30.